Where can a person go to get away for awhile, away from busy streets, away from ringing telephones, and away from the pressures of the daily grind? People look forward to that time of the year when they can leave their cares behind them for an enjoyable vacation. But crowded theme parks and long lines, not to mention exorbitant fees, are not things one seeks when considering a relaxing and enjoyable vacation. For those seeking the perfect getaway for relaxation, family fun, and perhaps a little romance rental cabins in Helen, GA may have just what they are looking for. In this comprehensive guide, we'll explore the following topics to help you think better and plan your next trip to the north Georgia mountains. Planning a vacation can be a daunting task. You must decide your destination, how you will get there, where you should stay, what entertainment and activities you'll participate in, and what your vacation budget will be. So, before you book your vacation in the woods, follow these planning tips to help you choose the right starting point. The greatest thing about vacations is that they are all unique. Each individual and family unit will have a different vacation objective, depending upon the time of year planned, areas visited and family members attending. Before searching for a place a to stay, take the time to consider what you hope to gain from your vacation experience. Are you looking to relax in peace and quiet? Are you looking to be near a city or town? What cabin amenities are important to you? Are you flying or driving to the rental? The answers to these questions may dictate your location choice. Before you find a picture of your ideal luxury vacation online, only to realize that it is unaffordable, be sure to set a budget. Setting a budget will enable you to pare down your choices, whether searching online or via a travel professional. Create a list of the attractions you hope to visit during your stay and search for lodging within a reasonable driving distance to the majority of your choices. Potential activity options could include: hiking, hunting, fishing, rock climbing, horseback riding or even skiing (more ideas listed in the things-to-do section below). Once you have narrowed down your search focus, it is time to start comparing available properties. Be sure to review the lodging's location, proximity to the activities you have previously outlined, amenities offered, availability and last, but not least, the pictures of the property's exterior and interior. The following in-depth section will help you navigate these many factors for renting. Once you've decided on which mountainous area of the south you would most like to visit, selecting your lodging is next up. You'll quickly find that there is no shortage of nice accommodations in the mountain towns. Because of the charming nature of the nearby cities, many couples make the decision to make a reservation with a local bed & breakfast. This can be a quaint and cozy way to connect with one another, to learn about the surrounding areas, and to meet with other travelers. While such a stay can be romantic and charming, though, it may not provide you with all of the luxuries that you are hoping for. It's also wise to keep in mind that B&Bs are typically more couples-oriented than family-oriented. Traditionally, hotels are a popular choice for lodging on a vacation. Upscale hotels can leave travelers feeling pampered and relaxed after a day of exploring the wilderness, tasting wine, or shopping for antiques. Hotels and motels can also be an affordable way to accommodate families during getaways. Many state and national parks allow vacationers to camp on site, enabling them to become fully immersed in nature. If you are looking for an affordable vacation that will allow you to really connect with the great outdoors, this is an excellent option. If you prefer to have creature comforts and amenities, on the other hand, you may want to consider something a bit different. Of all of the available options, a stay in a mountain cabin rental is the best way to both live in the lap of luxury and in the heart of nature, while also getting the most value for your dollar (At least we think so 😉 ). You would be amazed at how lavish these vacation rentals can actually be. Units with multiple floors, bedrooms, and bathrooms ensure that all guests will have the privacy that they need to feel comfortable, while common areas like living rooms, game rooms, fire pits, and a kitchen bring everyone together. You'll be able to relax and unwind in a hot tub or Jacuzzi while enjoying the spectacular views of the mountain ridges. You can even customize that view so that you can take in the sights of your choosing from your private balcony. Finish of the day by watching a movie with your family, listening to satellite radio, or cuddling in front of the fireplace with that special someone. If lodging in a cabin rental is the direction you plan to take, our next section will guide you on all the factors to consider as part of your decision-making process. What do you look for when selecting your travel accommodations? If you're like most folks, you are seeking a comfortable, clean space that is reasonably priced along with several other factors. As you explore your options, use the following reference list to help you pick the best for what you need. 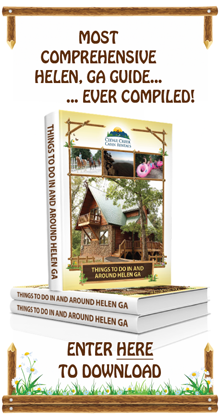 Helen, GA is a top destination for the Southeast and there are thousands of cabins to choose from. You can rent directly from owners as well as numerous cabin rental companies. So, how in the world do you start the process of researching which one to choose? There are many good companies that have gorgeous cabins that will provide an excellent home away from home, but although cliche, be sure the management company has the service to back up the beautiful cabin you see online. Finding that out is not always easy but one way is to check the reviews of what the guests are actually saying. A simple survey of what the guests say is a great place to start. Ask, before you book, what they do if there are any issues? As much as you hope you never have any issues, these are homes just like your own and on occasion there will be an issue that must be handled. It's better to know now than later when you're enjoying your stay. How a company responds to that need and the urgency of taking care of that need is of utmost importance if they want that return visit from you. It's the little things that either make or break that ideal experience and cause you to return or not. Here are other factors to consider as part of your decision. The mountains in north Georgia offer everything a vacationer could want in relaxation, and besides outdoor activities - like hiking, swimming, mountain biking, and fishing. The topography throughout the southern United States is quite mountainous, being home to the Appalachians, which feature both the Smoky, and Blue Mountain ranges. Both of these ranges are uniquely beautiful and have their own individual appeal to travelers. Helen offers fine dining with Bavarian hospitality and a variety of fun-filled attractions. Guests can also choose the view they wake up to in the morning. Cabins offer mountain vistas, waterfalls, creeks, and colorful wooded views, depending on the occupant’s preferences. The addition of woodland sounds, relaxing waterfalls and gurgling creeks add to the mystique. Helen also makes the ideal starting place to explore the mountain communities of northern Georgia including Dahlonega, Clarkesville and Cleveland. You'll find charming specialty shops, unique artisans and craftsmen, historic sites and amazing vineyards to explore. The best part about all of this? Your cabin rental in Helen, GA is smack in the middle of it all. Vacationers who make the decision to visit the eastern edge of Tennessee, for example, may want to enjoy the Smoky Mountains by spending time in the Great Smoky Mountains National Park. There is no fee to enter this national park, although there is an abundance of things for travelers to experience within its bounds. The area is teeming with wildlife, offers over 800 miles of hiking trails, features some 80 different historic buildings to explore, and affords guests some truly spectacular views. Generally speaking, this particular range is best for individuals who enjoy spending time in the outdoors and connecting with nature. The Blue Ridge Mountains are equally beautiful, and are known to dazzle vacationers who choose to spend their time in northern Georgia. The area surrounding the Blue Ridge mountain range is home to numerous quaint towns that feature wineries, antique stores, craft shops, and charming eateries. As with the Smoky Mountains, you will find a host of plant and animal wildlife, ranging from salamanders to fox to deer and beyond. Although the area definitely provides travelers with a positive experience with nature, it is also very family friendly, romantic, and filled with interesting things to do. Ask yourself, how much space you and your group will require in order to feel comfortable? If you are embarking on a romantic getaway, you'll be able to relax and unwind in a single bedroom cabin, but if you're traveling with friends or with children, you will all appreciate a little extra space. Do your kids get along well enough to share a room with bunk beds, or would it be best to keep them completely separated in their own individual spaces? How many bathrooms will your group need in order to keep the peace? Once you have considered these questions, you'll have a better idea as to how much space and how many rooms your cabin rental will need. This will help you to begin to narrow down your options and get you headed toward finding the perfect rental for you. Once you have focused your search onto only the cabins which meat your space requirements, you will need to plan for any specific needs or special interests that pertain to yourself or your group. If you are traveling with an individual who is elderly, has limited mobility, or is handicapped, you will want to take a look at cabins that have ramps and are handicap accessible. Those riding into the Helen area on a motorcycle may have an interest in selecting from the biker-friendly cabins that are available. And what about your beloved family pet? If you can't bear the idea of leaving your four-legged friends at home, there are also pet-friendly cabins to choose from. Booking a cabin can be as easy as going online or picking up the telephone (770-952-4130). Mountain cabins are extremely popular, so booking early is prudent. Also consider the season. Summer-time is popular for swimmers, whereas the winter transforms the snow-covered landscape into a frosty wonderland with the allure of Helen becoming a regular Christmas village. Fishing is popular the whole year round however. Spring-time is popular for romantic mountain interludes, particularly around Valentine’s Day, and autumn brings enchanting coloration to the mountains. This step allows guests to select all of the luxurious, and exciting amenities that will make your vacation truly special. Most guests absolutely love to stay in a cabin with either a hot tub or Jacuzzi (or both!) that affords spectacular views of northern Georgia as they soak in the hot, relaxing waters. Customized views can also be enjoyed from rockers that are situated on spacious, wrap-around porches or patios. Whether you would like to walk out your door and be greeted by the sights and sounds of the forest each day, if you're excited to see majestic mountains from your window, would find the sound of your own private creek to be soothing, or would be enchanted by a waterfall view, you'll be able to have your pick. If you love to grill out, you may want to choose a cabin that features a fire pit or a barbecue grill, and if you want to add a little warmth or romance into the mix, you can find a rental with a fireplace. Game tables, multiple TVs, stereo systems, and more can all be incorporated into your stay at no added charge to you. The next step to selecting your ideal vacation home and narrowing down the rentals is to stop and consider the creature comforts and things that you absolutely cannot live without. For some vacationers, the ability to stay connected to the office is essential. These individuals will need to book a cabin that has a reliable high-speed or wireless internet connection and a land line phone. Other travelers can't stand the idea of not being able to wash their clothes, and choose rentals that include a washer and dryer in-unit. And, if you don't want to lug bedding and towels along on your trip, you'll want to find a cabin where clean linens are provided. Can't live without a coffee maker? Hate to wash dishes? There's a cabin that will fit your every need. Cabin rentals are one place where it pays to read the fine print of an agreement. These agreements often cover what you can and can't do in the rental, your liability for any damage, check in and check out times, and other "need to know" informational items. Take the time to read through the agreement before your vacation so you know what to expect. You can view our rental agreement here. A huge benefit of cabins can be the kitchen, and the ease of eating home cooked meals. Most cabin kitchens come with the basic kitchen utensils you need. However, they won't come with specialty equipment and may have limited cookware. Check to see what the cabin kitchen provides and then bring your own knives, special pans and other kitchenware you will need to make those gourmet meals. Does the kitchen include the amenities that were stated? If you're missing basic kitchen tools like a bottle opener, will the company make sure you are provided the missing items? Cabins should provide enough linens to cover all the beds in the house and enough towels for however many people the cabin can sleep. But, you may want to consider bringing more towels especially if you plan to use the hot tub or Jacuzzi tub frequently. Does your potential rental come with the appropriate bedding and linens? If you have any concerns about towels, sheets and other linens or if it appears they weren't laundered will the cabin company handle that promptly? Cabin rental companies set check in and check out times for specific reasons. The times give the cleaning crew a chance to do their jobs and prepare the cabin for the next visitor. Knowing when you can arrive and when you need to leave can save you headaches and extra fees. If you feel you need early check in or late check out, be sure to ask. Some of our cabins are located on secluded, private lots. The seclusion allows you ultimate privacy and the ability to escape from your every day worries and stress. There's no need to fret about noise or being disturbed by other travelers. You have the freedom and privacy to come and go as you choose while ensuring that the vacation meets your specific needs. Imagine enjoying a warm cup of coffee on a cool mountain morning. The serenity of your cabin's back porch will help you get your morning started in peace and privacy. When you choose a cabin rental for your vacation lodging you'll quickly discover how convenient it is. Cooking meals on site eliminates the hassle of waiting for a table at a restaurant, guarantees meals that everyone will eat, and will save you money. When you return to the cabin after a fun filled day you also have plenty of space for your group to spread out. The kids can play in one area of the cabin while the grownups unwind elsewhere. The cabin amenities help ensure that there is plenty to do on site for everyone in your group. Still not ready to make the call and book your vacation? Consider the ease and flexibility of cabin rentals. Rent a small cabin for two for a romantic weekend. Book a larger house with family rooms and plenty of outdoor space for a family vacation. Or consider booking several houses next to each other for a large family reunion. You'll find a cabin to meet any vacation need, large or small. With a cabin, you also have the flexibility to shift your vacation plans in an instant. Your plans to hike a portion of the historic Appalachian Trail may change and you may feel the call of the Georgia Wine Country instead. With your own cabin rental in the heart of northern Georgia, you get to set the pace of your vacation. Additionally, a cabin rental in Helen, GA will also save you some cash. You can prepare and cook your own meals, you won't have to pay for parking and you have built-in entertainment in the cabin. Most cabins include state-of-the-art home theaters and other treats like pool tables or Foosball tables. When you consider all the amenities included in cabin rentals the value is amazing. The cabin rental price includes on site entertainment, a fully equipped kitchen, a convenient location, and the chance for your entire group to enjoy the vacation under one roof. Especially for large groups, which would require multiple hotel rooms, the choice of a cabin rental is incredibly affordable. Consider how many hotel rooms your group would need and then compare the total price to a single cabin rental; the savings are obvious! Our cabins are all close to the mountain retreat of Helen, Georgia as well. Once you enter this Alpine wonderland you'll understand what makes Helen so special. The streets are lined with specialty and antique stores, delicious restaurants featuring German favorites, and entertainment options for the entire family. Helen also knows how to make any celebration memorable. The annual Oktoberfest celebration, as well as many other holidays throughout the year, are celebrated in style in Helen. Are you and that special someone in need of some private time alone together? One of the best ways to rekindle the romance and enjoy some quiet time for two is to stay in one of the secluded cabins. Georgia is a wonderful place for couples to visit, not only because of the lush cabins for two, but also because of the many couples-oriented activities in the Helen area. Besides enjoying a luxurious and romantic soak in your cabin's private hot tub or Jacuzzi bath, you and your sweetheart can enjoy a hand-in-hand walk through the gorgeous wooded areas near the cabin, go on a wine tasting excursion at Habersham Winery in Nacoochee Village, enjoy a couple's massage at Nacoochee Crossing Wellness Center & Day Spa, or watch the sunset on a horseback ride for two at Sunburst Stables. When you are done enjoying these couples activities, you can return to the cabin for a romantic dinner for two or curl up together next to your own private fireplace. 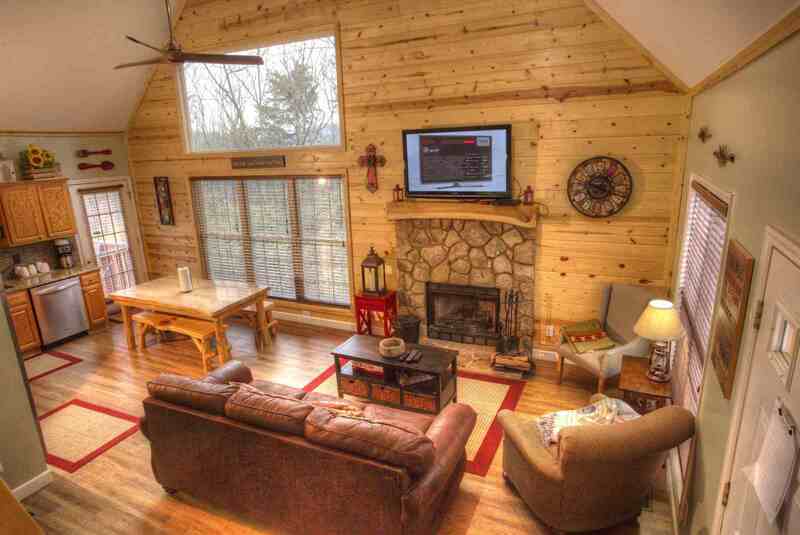 Enchantment - This cabin is located just ten minutes from downtown Helen but is located on a secluded lot making it perfect for a romantic weekend getaway. A small creek runs across the back of the property and guests can enjoy seasonal mountain views. This peaceful backdrop provides the perfect scenery for a quiet afternoon walk or enjoying your morning coffee on the back porch. Guests will enjoy the jacuzzi tub that sits just at the foot of the king sized bed and provides a private, spa-like experience. Hickory Woods - A wall of windows overlooking the secluded woods makes the Hickory Woods cabin unlike any other property. These windows bring the outside in and provide plenty of natural light throughout the cabin. The sunken living room, open kitchen, and gazebo covered outdoor hot tub are all features that make this cabin incredibly popular with guests. Outdoor amenities include a fire pit, large wrap around porch, charcoal BBQ grill, and a private creek. Hummingbird Lodge - Hummingbird Lodge is a part of the local Innsbruck Golf and Country Club and offers guests free use of the club's onsite swimming pool, tennis courts, and reduced golf fees. This cabin is ideal for families because it offers many different on-site entertainment options. It boasts an eight foot pool table, ping pong table, hot tub, three flat screen television sets, and DVD player. Parties of up to ten people can spread out in the three bedrooms and loft area with a queen sofa bed. If you are planning a vacation for a large group you will likely benefit from contacting the professionals at Cedar Creek Cabin Rentals. We can help you find the perfect combination of cabins to meet your specific needs. There are also plenty of options for large groups, such as family reunions looking to stay in the Helen cabins. Georgia is a wonderful place for families or groups of couples friends to come together and bond. You can book entire park-like developments which feature multiple cabins that can accommodate multiple couples and families from as few as six to as many as 120, depending on how many other people will be joining your party. Planning a visit to these blocks of cabin "development" is ideal for large groups who want to set up volleyball or bad mitten nets, play outdoor games, and just enjoy each other's company while still being able to retreat to the peace and quiet of their own cabin and sleeping quarters. For those who are looking for some added security, you can also choose to plan a visit to one of the gated cabin rental communities. This ensures that only those with a key card or access code will be able to reach the cabins so that you can protect your family and friends. The cabins Georgia has to offer also extends to groups of friends who are traveling together. With rentals that sleep up to twelve individuals, your whole party will have plenty of space to stretch out and enjoy their own privacy while splitting the cost of an extremely affordable yet amenity-packed cabin! Friends may choose to select from cabins that feature game rooms with Pool tables, Foosball Tables, or Ping Pong. Your group may also decide that they would have a good time enjoying a cold drink and roasting marshmallows or hot dogs around a fire pit, or grilling out on a charcoal barbecue grill. On top of all of the great features found in the cabins, Georgia is also a wonderful place for friends to enjoy a number of activities together. Your party may enjoy white water rafting down the Chattahoochee River, going on an extreme zip line tour and more! For families with pets, it can be very hard to leave your animals behind as to you, they are truly a part of your family. Because of this, the cabins Georgia offers also include pet-friendly options. Though our cabins are luxurious, we still provide select cabins for those who would like their four legged friends to join in the family fun. Besides allowing for pet accommodations, there are also plenty of pet-friendly activities to enjoy in the area. Of course, Fido is always welcome on a nature hike through the vast timberland forests near your cabin rental, but you can also walk your pet around town and even take him mini-golfing with you at the Alpine Helen Miniature Golf Course! You'll also find that many local restaurants that feature outdoor dining will allow your dog to sit with you on an outside deck or patio while you take in the local northern Georgia flavors. Guests can escape to their own mountain paradise in Paradise cabin where one can relax with the amazing view of a private waterfall from the deck. One can picnic by the creek or hike in the beauteous scenery of the surrounding woods. 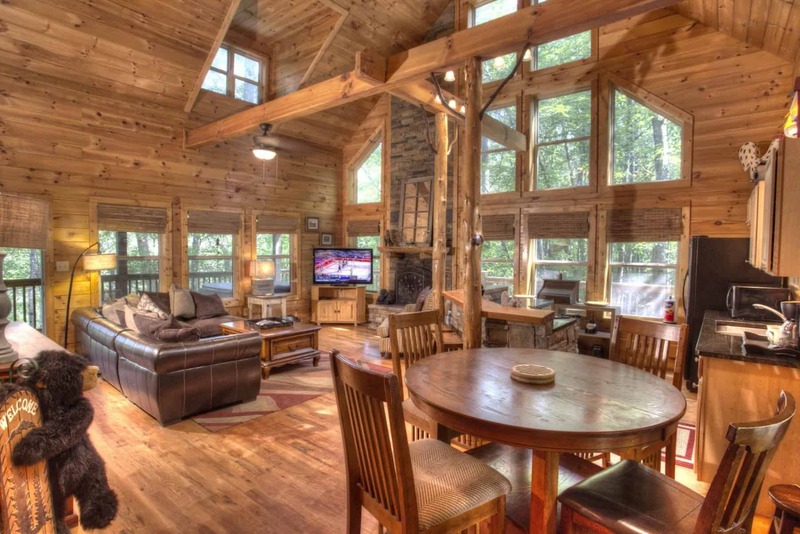 The cabin offers the amenities of home with similar luxuries to other rental cabins in Helen, GA: WiFi Internet TV with surround sound, hot tub, pool table, and Jacuzzi. A charcoal barbecue grill allows guests to enjoy cabin life at its finest without letting go of pampering comforts. 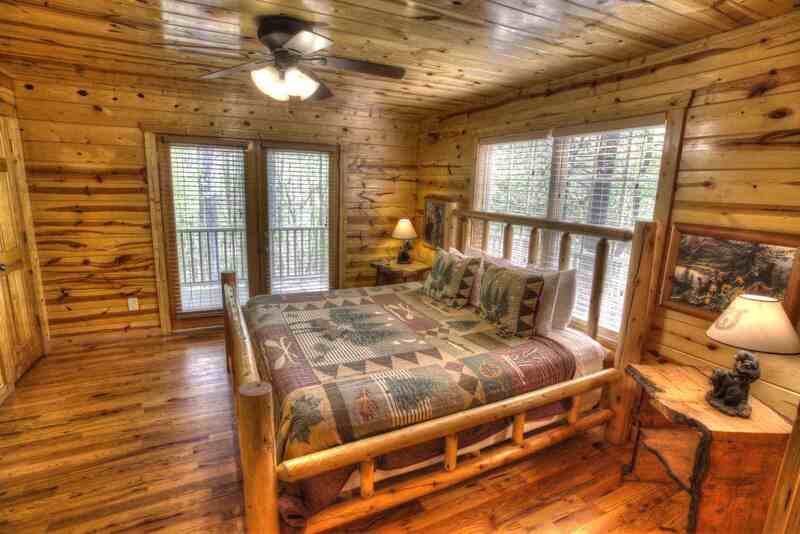 You can choose from several other luxury cabins near Helen, GA as well. Try Summit where you can relax on leather sofas in front of a giant stone fireplace and take in views of the mountains. Out on the deck, sip a glass of wine from the hot tub overlooking the beautiful, scenic forest. One bedroom has its own private deck. The family room features a pool table and yet another stone fireplace to keep you cozy and warm all night. This cabin comes with one set of bunk beds making it perfect for a family retreat. What kind of memories can be created? The usual outdoor activities are available. One can hike down to the twin Anna Ruby Falls for unforgettable photos. There are trails for mountain biking, and, swimming and tubing down the Chattahoochee River is always an option with Cool River Tubing Company. If horseback riding is one’s idea of fun he can pay a visit to Sunburst Stables. And a truly unforgettable experience can be gained by taking a ride in a hot=air balloon with Balloons Over Georgia. Besides indulging in a luxurious cabin, you will have many outdoor activities to pursue. With thousands of acres of natural forests, you and your family or friends can go on an adventurous hiking trip admiring the beautiful fall foliage if you plan on taking a trip at that prime time of year. The Helen, Ga Cabins are located amongst some of the areas most glorious waterfalls. Along with hiking trails of 1.2 miles long along a beautiful, breathtaking route, you can't go wrong if you are looking for adventure amongst the Appalachian Mountains in the Peach State of Georgia. If you go to the town of Helen for a day out on the town, there are galleries and shops along Highway 197. This is a scenic highway so you may want to bring your camera. With outlet stores and restaurants and other local area attractions, your vacation will be filled with abundance. Helen, Ga also offers its residents and visitors one of the the longest Oktoberfests in the country. If you are into various sporting activities, there are mountain biking trails in Unicoi State Park. Unicoi State Park is 2 miles from the Cabins Helen Georgia houses. It has campsites, fishing docks, and summer boat rentals. A variety of hiking trails are also amongst the back lay of the beautiful GA mountains. Golfing you will find if you want to relax on a lush green field for the day. You can also go fishing or white water rafting for an exciting river adventure. The glorious Anna Ruby Falls are north of Unicoi State Park and can be accessed both by foot or car. Don't miss out on the waterfalls if it's the only thing you do. The Cabin Rentals Helen Georgia has for it's vacationers are high up in the Georgia Appalachians where wistful sounding streams swoosh by while you sit underneath the lush green trees having a picnic with your loved ones. If you are looking for excitement, you will find it here at the many Cabins Helen Ga offers. There are many varieties of locations as well as different types of cabins to choose from. Have you ever had someone tell you that a glass of wine was good but, to you, it tasted like crud? If you don't drink, that is probably a good thing, but the point is that everyone has different tastes. What is luxury to you may be different to someone else. We think that luxury cabin rentals include all wood walls and floors, granite and tile surfaces, and have all the amenities like pool tables, hot tubs, jacuzzis and the killer view. It also has to be kept up and well maintained to get that mark. Many claim that a vacation area has luxury accommodations while at cabins in Helen GA and it very well may, but there is one thing that will make it go from luxury to dumpy and that is when you can't get service should there be an issue. So you planned your family vacation or romantic getaway and shelled out $500 to $1000 for your trip. Then just before your arrival, lightning strikes and takes out all the electrical components in the cabin. Now what? In this case the management company may have said they would (free of charge) move you to some other accommodations (their back up cabin). It was not their fault that lightning struck the cabin. This is true, but you want cabin number one, and fast. Travel Tip: Be sure the management company is prepared to handle these type situations with plenty of inventory and staff to handle urgent matters. Isn’t it about time to start enjoying life again through the luxuries available in rental cabins in Helen, GA?